And so it's time for Day 3 of the NYC Diaries: my tediously lengthy account of almost everything the Man and I did in New York for a week's holiday in October half term. If you want to catch up on the story so far, I have blogged about Day 1 here, and Day 2 here. While I have cut this down a bit to post here, I mainly wrote this for my own record as I wanted to have a really detailed account of our trip. And not just the events and the tourist highlights, but the little things, the anecdotes and the in jokes. So I make no apology for my travel journal, and organising my journal entry with my photos will be helpful when I come to scrapbook the adventure. So, without further ado, let's get to Day 3. Radish Fact of the Day: While the most commonly eaten part of the radish is the taproot (a central chunky root that other little roots grow sideways out of, like a carrot) the entire radish plant is edible. We slept in until gone nine (totally necessary) and upon waking, the Man once more did not appreciate radish fact of the day. However, I am of the opinion that if I continue to mightily flog this particular dead horse it will get up and go eventually. We started the morning by giggling at a picture the Man found of two guinea pigs dressed as dinosaurs captioned: Raowr: I am a guinea-pigasaurus. Excellent: good work Internet. This also led to a search for other animals dressed as dinosaurs, but none were as good as the guinea pigs. It was the Man's turn to get up and make tea and run to the bakery. Which he did as I made my second and third rounds of tea and a pot of coffee for him, and ate one of my not-a-biscotti while I waited. I was ravenously hungry and couldn't wait. He came back with two cinnamon buns for breakfast though so all was well. 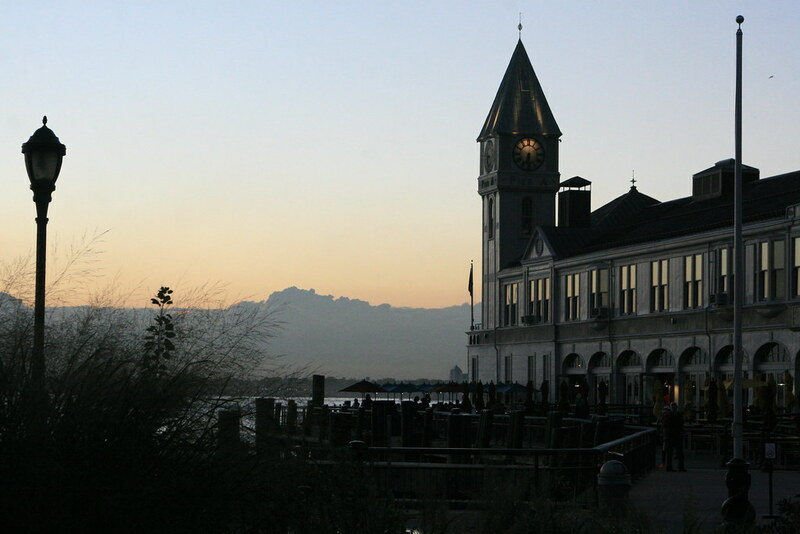 It was around half twelve when we finally left the house after an indulgently lazy morning, lingering over breakfast. And it was bucketing down. 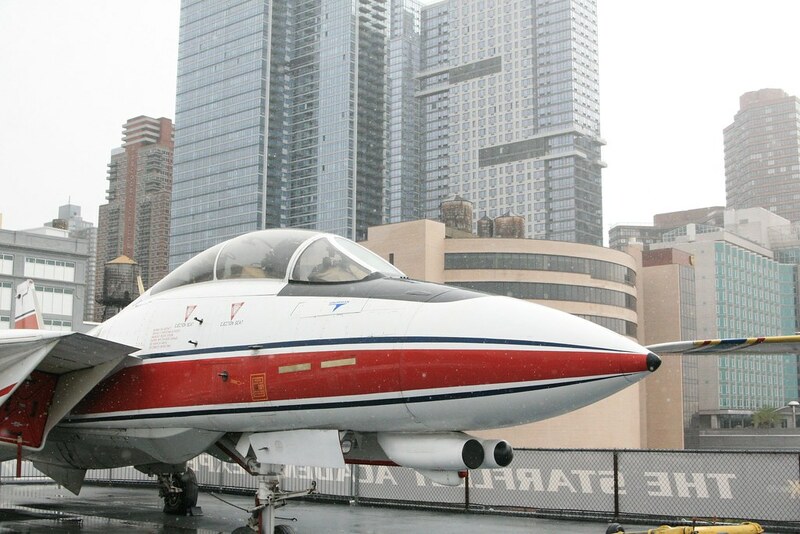 So with raincoats on we sauntered out to the subway to catch the A train up to 42nd, this time to visit the Intrepid Air, Sea and Space museum. We came across this by accident when we did the boat tour and thought it might be great to visit on a day with poor weather. 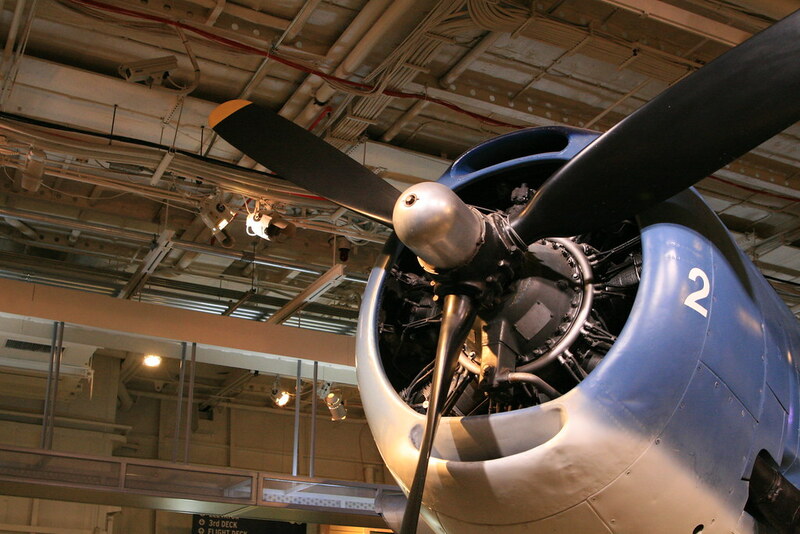 The Intrepid is an enormous aircraft carrier that's now a giant museum. Or if you're in the military and know about such things, the Intrepid is a smallish Essex-class aircraft carrier that's now a museum. 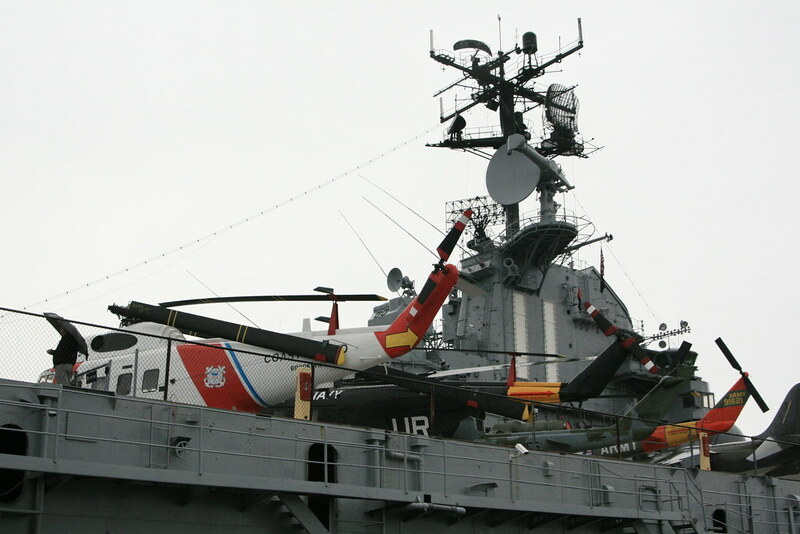 On the flight deck, there are numerous examples of aircraft from WWII and the Vietnam and Cold War eras. 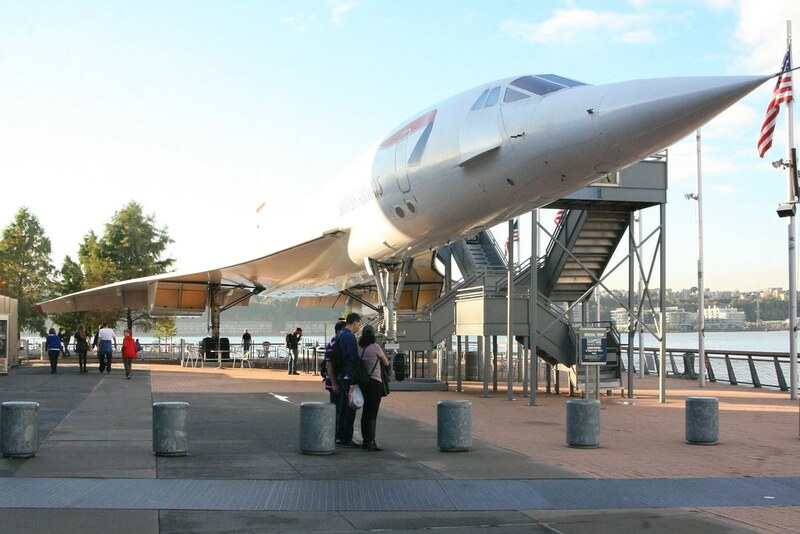 Oh, and Concorde. Meanwhile there's also a retired submarine moored alongside, and the space shuttle Enterprise is housed in its own hanger on deck. Plenty to be going on with then! We started with the submarine which was named Growler. We wove through the cramped tunnels: there's no space and the lack of windows and real air seemed oppressive. Tough to imagine what it must be like to live there. Apparently it took about 80-90 guys to man the analogue submarine. We saw their squashed living quarters and learned that they would sometimes hot-bed it: when you get up to do your shift the next guy to sleep goes in the bed you've just vacated which is still warm. Cuts down on space needed for bunks as you never have everyone sleeping at the same time. Interesting fact: analogue submarine means everything was calculated by hand. So if you knew the speed and direction of the submarine at each moment, you could use that to plot your location relevant to an initial known position. Another submarine fact: most submarines actually use passive sonar to navigate and see where you listen to the existing sounds of the sea coming back to you. The active sonar that seems to dominate films is used less as it gives away your position because you're sending out pulses actively to monitor the reflections. We then ascended to the Intrepid flight deck to see the aircraft collection. They had a huge range of aircraft spanning key historical battles. One of my favourites was a plane called the Tiger which had a bit of a mishap: it had fired its torpedoes and then went into a dive, but flew faster than the bombs and ended up crashing into them, thereby bombing itself. Awkward. Also on flight deck was space shuttle enterprise. It had its own special entrance and was housed in its own hangar and it was HUGE! And amazing: I've never seen a space shuttle before. Enterprise (so named after a campaign started by Trekkies) never actually went to space but was designed as an experiment by NASA to see if they could build space shuttles that were a bit more like planes that could go up to space and then land. So Enterprise was launched from rockets but could get back to Earth. Whoop! Science success. However, adapting Enterprise to go into space was deemed too expensive an overhaul and so a different shuttle underwent that process (I think Columbia, but it's hard to remember because of all the facts). Anyway, Enterprise was made of the wrong stuff. Apparently if you're in the spaceship building business you should be using carbon-carbon. Obviously, duh. And while I couldn't find an explanation as to what carbon-carbon is, basic maths tells us that it must be at least quadratically better than carbon, as it's carbon squared. Speaking as a carbon-based life-form, I should know. 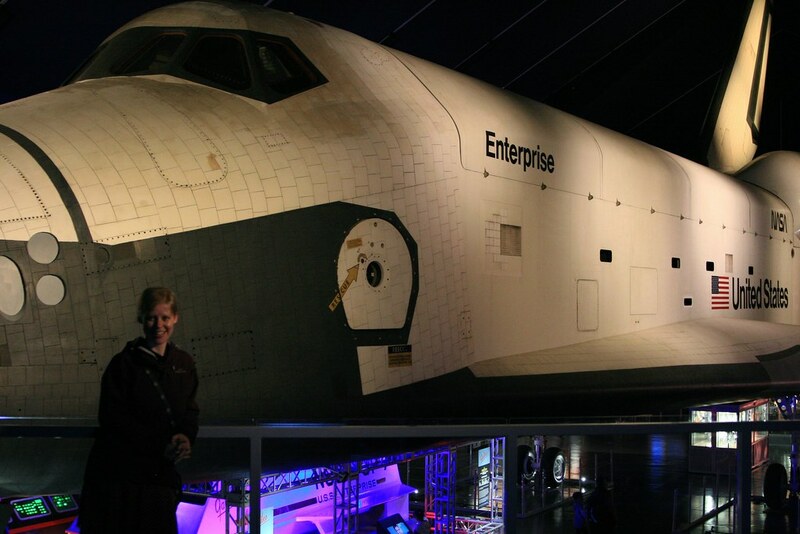 We took some Enterprise selfies and pictures, which was challenging as it was too big to fit in the lens of my camera, but it was fascinating to see this magnificent piece of engineering and such a key part of the astonishing exploration of space. I got a NASA badge for my camp blanket to mark the occasion. We went inside the Intrepid to find out a bit about the history and conditions of life on the ship. 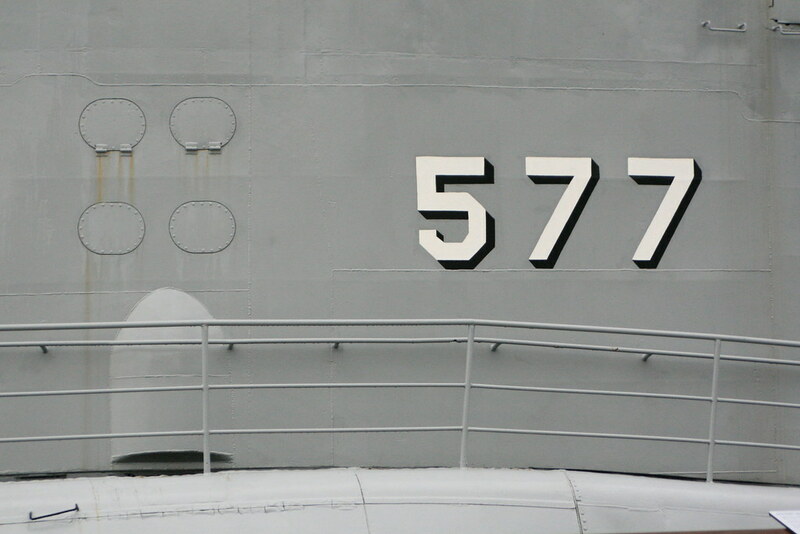 After the submarine it seemed spacious: the ship was designed to be manned by over 3000 men. Huge! The Intrepid would typically be the flagship of a fleet and so would have its own Captain responsible for it, but the Admiral of the whole fleet would also be on board with his fancy quarters. The ship had a huge turning circle, and was involved in Vietnam. It had a big redesign partway through its life so that planes could be lifted up from the lower deck to the runway more efficiently. The whole thing was immense and it's hard to get your head around how it all works. Finally we clocked in with Concorde and took a few pics. Sadly we couldn't go inside but it was cool to see. The Man's explaination of Concorde is that "it sounds just like a normal plane but you only hear it after you land. Because science"
After that, we hit the next major NYC food group: pizza from "99 cents fresh slice" pizza. It did what it said on the tin: a slightly dingy joint where two slices of cheese and tomato pizza were slapped on a paper plate for us before we could actually order. But oooh, it was yummy. Really hit the spot! 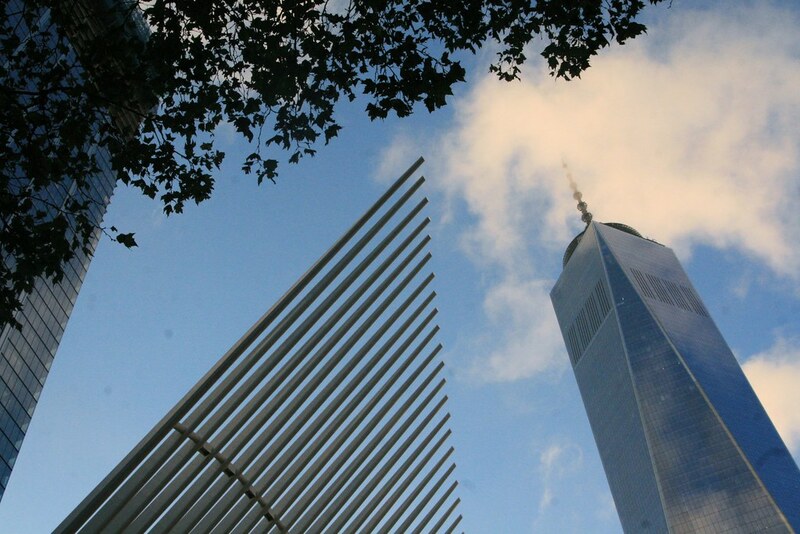 We got the subway down to the World Trade Centre to visit the 9/11 memorial. It was quite peaceful and very sad, and the water flows endlessly over the edge of deep fountains into the abyss. The names of all the victims are carved into the edge and the whole experience was very poignant. We finished the evening by strolling down to the very tip of Manhattan and visiting Battery park. We sat on a bench looking out over the water and could see the Statue of Liberty in the distance as the dusk fell and the Staten Island ferry making its trek with lights ablaze. 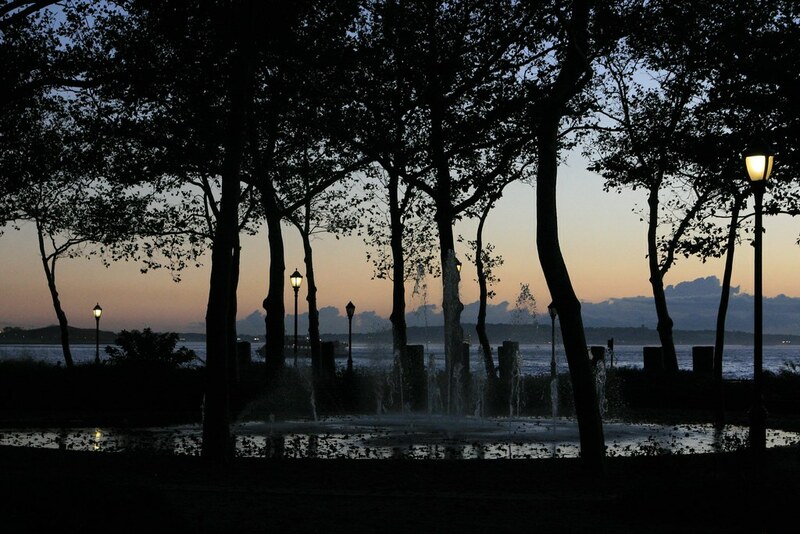 The sun set and we enjoyed seeing the park and admiring the fountains. Once we got home it was definitely time for a glass of wine. I think we were both pretty tired from the previous evening. The weather had improved a tad and so we sat on the balcony with the twinkly lights on. Chinese take away was the order of the day for dinner, and we found one only two blocks down. Google reviews recommended the dumplings and so we split a portion of the pork ones and picked another dish each. The lady running the shop was lovely, the food was tasty and the portions were huge so while we managed to finish the fabulous little dumplings we only got about half way through our food. Nom nom nom. In fact the only downside is that it came in normal Chinese takeaway pots, rather than in the cartons with chopsticks that you always see on the telly. Still, you can't win them all. We sluched in bed then to watch Sharknado 3 but the Man was pretty tired and nodded off part way through, and trust me, if you fall asleep during Sharknado, you are definitely sleepy. As at least half the fun of the Sharknado films is watching in company and sniggering, we called it a night and caught up on some sleep. P.S. And that takes me almost half way through the trip. Tune in next time for the terrifically-titled Day 4. It really will be jolly good.